90 percent of the long journey is over, with a bit more than 300 million miles to go before the encounter with Pluto/Charon next summer. Newly awakened from hibernation, the spacecraft will be put through a complete checkout of its onboard systems and scientific instruments, as well as conducting its first optical navigation campaign to study the approach into Pluto. Stern also reports that the upcoming cruise science will include imaging Pluto and its moons to study their light curves, seen by the spacecraft at a different angle than can be observed from Earth. 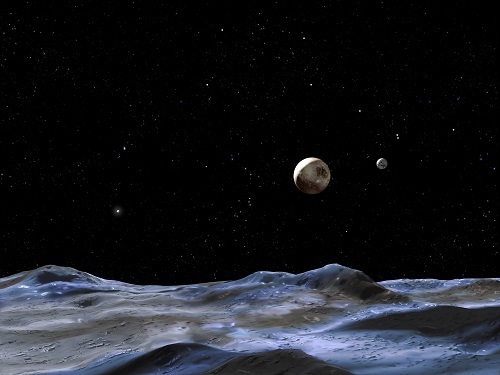 Image: This artist concept shows Pluto and some of its moons, as viewed from the surface of one of the moons. Pluto is the large disk at center. Charon is the smaller disk to the right. Credit: NASA, ESA and G. Bacon (STScI). So we have one more thing to look for as we approach Pluto/Charon next year. Bear in mind that Charon is unusually massive when compared to the body it orbits, about one-eighth of Pluto’s mass. Scientists believe the moon formed much closer to Pluto as the result of an impact that ejected material from Pluto to form the system of moons. Charon’s orbit is now circular, with a rotation rate that keeps Pluto and Charon showing the same side to each other at all times. Without significant tides in its present orbit, the odds are that any underground ocean inside Charon is long frozen. The paper is Rhoden et al., “The interior and orbital evolution of Charon as preserved in its geologic record,” Icarus, published online 30 April 2014 (abstract). This NASA news release has more. The Continuing Saga Of Planet X: Could More Massive Planets Hide Beyond Pluto? Just like the proverbial cat with nine lives, the notion of an unseen planet orbiting beyond the known limits of the Solar System, seems to be coming back from the dead once more. The recent discovery of 2012 VP113, a dwarf planet candidate with a highly elongated orbit and the largest known perihelion to date, has led astronomers to theorize about the possible existence of a more massive planetary body in the far reaches of the Solar System. Now, a new study comes to give more credence to these speculations, by concluding that not one but two such planets could indeed be circling the Sun, in the vast expanses beyond the orbit of Pluto. Not to be confused with the crackpot predictions of doomsayers and conspiracy theorists, the real scientific search for the hypothetical Planet X had been ongoing even before the discovery of Pluto by American astronomer Clyde Tombaugh in 1930. Observed anomalies in the orbit of Neptune, were seen by 19th century astronomers as evidence for the existence of yet another planet further out from the Sun, whose massive gravity was influencing the motion of the then newly discovered planet around the Sun. Even though the discovery of Pluto was initially heralded as the solution to this intriguing mystery, the slowing realisation in the following decades that the dwarf planet’s mass and size were too small to affect Neptune’s orbit in any meaningful way, helped to bring the Planet X hypothesis back into the spotlight. But when NASA’s Voyager 2 spacecraft passed by Neptune in 1989, astronomers were able to acquire more detailed measurements of the ice giant’s mass which accounted for the previous observed anomalies in its orbit, negating the need for the existence of a tenth planet beyond Pluto. When it seemed that the Planet X mystery was finally laid to rest, the discovery of a minor planetary body named 1992 QB1, a few years later, finally awakened us to the presence of a whole new realm of Solar System real estate of Trans-Neptunian Objects, or TNOs, known as the Kuiper Belt. I hope JPL will be able to deliver a true-color full-disk shot of Pluto (and Charon too, as a bonus) to increase the solar system image menagerie. Ditto Dawn at Ceres. Frankly, beautiful imagery is equally important to science for these missions – it’s what inspires people and communicates with the general public who don’t necessarily connect with mere statements about interpretations of data. So here’s hoping that Pluto and Charon (and Ceres) look exotic, and not just variations on Enceladus or Triton or whatever. How many in the general public remember or would know what Triton looks like? Without having to look it up? When Voyager 2 flew by Triton in 1989, many in the planetary science community said that this is probably what Pluto looks and acts like (the geysers). It was said partly to comfort themselves at the time because no missions were planned to Pluto, plus it was probably right. Had Voyager 1 been aimed at Pluto and not Titan when it flew past the Saturn system in 1980, the probe would have reached Pluto in 1988. I wonder if any follow up missions would ever have been planned after that? Note the lack of such serious plans for Uranus and Neptune after Voyager 2. Evidence for a high-eccentricity phase for Charon would be interesting given the near-resonant configuration of the outer satellites. Probably would wreak havoc with a lot of theories as to the formation of the Pluto system. Note the lack of such serious plans for Uranus and Neptune after Voyager 2. This is a real shame, as these planets appear to be the closest thing we have to the super-Earths that are being found all over the place. Uranus in particular seems to have got a bad reputation since Voyager 2 went past at perhaps the most boring season of the year weather-wise (solstice rather than equinox). A Galileo-type probe into the atmospheres of both Uranus and Neptune would be a valuable mission, and I mean both of them since the two planets apparently have substantially different internal structures as regards heat sources. As New Horizons approaches Pluto, I can’t help thinking of Voyager’s approach to Io. In that first case, everyone knew it would just be as encounter with another boring dead world, nevertheless its impact record could be useful. All that said otherwise was unexplained alterations in colour and albedo immediately after an eclipse but hay… that was just Io’s way. Now we come to the cold dead world of Pluto, that just has this thing where it goes through colour changes much more extreme than Io ever showed. It also has a much denser atmosphere than can be easily explained – but that is just Pluto… right? Flybys to the outer planets should be considered. Passing Jupiter and one of its moons on the way to Uranus or Neptune (or a centaur asteroid) and then onwards to a KBO. The probe could maybe split up into multiple sub-probes with sets of instruments and cameras that pass Neptune on different sides and nearby multiple moons. Only the main probe would need a lasting power supply and Earth communication capability. The earlier arrival of a flyby, compared to an orbiter, means more modern and light weight instruments. Given my interest in future planetary missions, I regularly look through lists of missions submitted to space agency mission selection competitions. I also read through the abstracts of mission concepts presented at the many planetary science and engineering conferences each year. Uranus is trending. Why the interest now? First, the 2011 Decadal Survey ranked a $2B Uranus orbiter and probe mission as a priority to launch in the coming decade. (Alas, new budget realities make any such mission look 20 years away or more now.) Second, the Uranus-sized worlds are proving to be common in other solar systems and may be the most common type of planet in the galaxy. Our only up close examinations of planets in this class were the flybys of Uranus and Neptune in the 1980s by the Voyager 2 spacecraft that carried 1970s vintage instruments. Third, NASA’s development of the light and relatively cheap ASRG plutonium-based power systems enables cheaper missions than were possible with the older, heavier power systems. And fourth, the changing outer planet alignments have made gravity assists from Jupiter and Saturn to shorten flight times to Neptune impossible the current mission planning window. Jupiter is still available for Uranus missions in the coming decade. The ice giants are the forgotten sisters of interplanetary exploration. Now astronomers are arguing for an ambitious twin-probe mission with a launch date of 2034. Perhaps if the new BoldlyGo space exploration NGO finds its footing, some day it will supply probes to the other two blue planets in the solar system. Nuclear power is probably too difficult, but maybe there can be a beamed power system that sends power in pulses from solar satellites in an inner-system solar orbit. A Uranus orbiter to be launched in 20 years. Plus probably 15 years travel time. That’s 35 years. The time between the first sub-orbital rocket, the German V2, and the Moon rocket Saturn V was about 20 years. A 35 year project to Uranus will never happen. That kind of mission design is impossible, don’t waste time on it. But waiting for beamed propulsion based in space that could propel probes to Uranus and Neptune means adding decades to the mission realization. Nuclear power is still available and the probes will have their power source with them and there will be no need to worry if something goes wrong with a power satellite or station. ‘where’ do you GO to look up this info ? There is still the possibility of using fission fragment sails, very efficient and we could use waste products of a fission reactor say built on the moon, there is plenty of thorium around. We could spray the decay products onto a sail after it has been deployed from a simple particle accelerator, the fission by products would be easily ionised. Requiring something built on the Moon for the probe would mean we need to have a fairly sophisticated infrastructure there to being with and I do not see any spacefaring nation having such a setup in place for decades. Plus recall that not too long ago the current NASA Administrator nixed any plans for lunar colonization. So how about using the waste products from fission reactors on this planet? They already exist and perhaps we can convince folks that this would be getting the material off Earth forever. Let us just stop hoping for any kind of major setup in space any time soon, or it will be the next century by the time we visit the outer worlds again. If we did setup a base it would be the first steps to the stars, without the colonisation of the moon we will not become a space faring species for 100’s of years. We need the moon with its closeness and resources. We had enough trouble getting plutonium oxide into space, highly radioactive decay ones would be a disaster if they fell back to Earth. Once you stop hoping you stop believing. I did not say we did not need a lunar base. I am saying that if we want to explore the outer planets in the next few decades rather than the next century, we should not have to rely on infrastructure that has not even been made yet let alone set up anywhere in the Final Frontier. That includes a lunar base with mining operations. I have never stopped hoping, I just get tired of people saying stay positive and they only hope that someone in the future will solve everything. We need to do things NOW with the materials we have. The longer we delay, the greater the chances become that someone or something will fail. As for worries about nuclear materials crashing on Earth during a failed launch attempt, I already went through that with Cassini. There has been a program in place for decades to ensure that nuclear items aboard a rocket survive impacting our planet: They are called ICBMs. The RTGs of space probes were shown to withstand even the explosion of the rocket along with a crash. All thanks to Cold War technology. So that should no longer be an impediment to launching the radioactive material needed to get your fission fragment sail working. Assuming we are still a bold culture who want to do things ourselves now rather than in a vague and unpredictable future. Plutonium 238 oxide is a lot more stable than other radioactive decay products from a normal nuclear reactor reaction. There is little hope of producing Pu 238 in quantity. I was thinking along the lines of the immediate or certain filtered decay products of U235 been sprayed on to the deployed sail, the nice thing about accelerators is that they can extend the half life of decay products significantly until they are needed. I have been thinking more about how those hints of high surface activity (much higher than Io or Earth which come distant 2nd and 3rd as measured by colour changes) and low energy available in a (currently) completely tidally locked system of bodies with very low heat retention capabilities. In our moons formation there was theorised that there was two, the other re-impacted the moon shortly after, so it is not completely out of the question to have a few moons from one impact. Scientists are attempting to map Pluto’s icy depths using old telescope data before a NASA spacecraft reaches the distant dwarf planet in 2015. The researchers say they found hints of frozen chemicals hidden beneath Pluto’s crust in data obtained by the James Clerk Maxwell Telescope (JCMT) on Hawaii in the late 1990s. “This was a bit like using a telescope as a digger to mine into Pluto, but with less effort!” astrophysics researcher Jane Greaves of the University of St. Andrews in Scotland said in a statement. They say there’s no such thing in life as chance, but only choice. That certainly holds true for NASA’s New Horizons mission which has been the culmination of more than two decades of efforts by the space agency and the planetary science community alike to study the last unexplored frontier of the Solar System: dwarf planet Pluto and the vast expanses of the Kuiper Belt that lie beyond. Yet, in what can be described as a unique cosmic coincidence, New Horizons, which has been travelling through the outer Solar System for the last 8.5 years to reach its destination, has just passed the orbit of Neptune earlier this week, exactly a quarter-of-a-century after the iconic Voyager 2 spacecraft gave humanity its first close-up views of the fascinating ice giant planet, in August 1989. Having completed this major milestone, New Horizons is now in the homestretch of its historic journey toward Pluto, where it will arrive in less than a year, for its long-awaited flyby of this fascinating and mysterious world. Staying true to the nature of its mythological namesake, Pluto is currently holding the keys to the Solar System’s gates of the unknown, beyond which lies a vast expanse that we know very little about. In large part due to its great distance from the Sun, which on average is approximately 5.8 billion km, Pluto is the only planetary body from the Solar System’s total real estate that has never been examined up close by any visiting spacecraft during the 50-year history of planetary exploration, thus essentially remaining remote and exotic, ever since it was discovered by American astronomer Clyde Tombaugh in 1930. Yet, with the discovery in the 1990s of a new region of minor icy planetary bodies beyond the orbit of Neptune, known as the Kuiper Belt, the interest among the planetary science community for Pluto, and the rest of the uncharted territory that laid beyond, was renewed. After a series of failed attempts during the 1990s to develop a dedicated science mission to explore these unknown frontiers of the Solar System due to budgetary constrains, namely with the Pluto Fast Flyby and Pluto Kuiper Express concepts, NASA finally earned the support of Congress for conducting a Pluto-dedicated mission, following a coordinated lobbying campaign by the planetary science community. It was out of this campaigning effort that the $650 million New Horizons mission arose, in 2001, being the first in the space agency’s New Frontiers-class of missions.